How do I enable/disable Inbox message notifications? Your Inbox stores all incoming messages and replies sent from subscribers or people who text in to your Longcode. You can be notified on your computer as well as on our IOS or Android app. Disable/enable email notifications - Login to your account, go to Account Settings, and scroll to the bottom of the page. Select or deselect "Email on Opt-in" (when someone joins any of your Lists), and "Email on Incoming Text" (when you receive a new Inbox message). 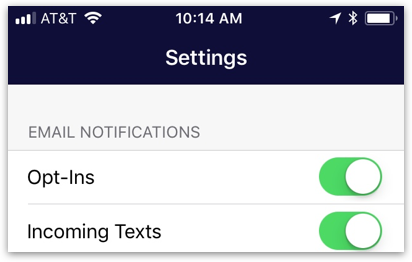 Disable/enable mobile app push notifications - Go to Account Settings (bottom right icon) in the Clearstream app. Select or deselect Opt-ins and/or Incoming Texts.